Metro has a clear focus on providing safe, reliable, and efficient service across our entire county. When it comes to operations, our best days are our least exciting, when a few thousand buses come back just like they went out: safely and on time. However, as we focus on delivering top notch service each day we can’t lose sight of the fact that to stay ahead of the curve, Metro needs to have long term vision. Where does Metro want to be as an agency in 10 years? How do we want to serve LA County? How should we align our policies, plans, projects, and programs to ensure we are set up for success? And how do we benchmark and measure progress? Strategic planning is an agency-wide process that can answer these questions through broad agreement on goals and policies that serve Metro’s vision. OEI is working with staff across Metro, as well as with our partners and customers, to create business strategies that tie programs together across Metro and align them towards a focused purpose. Our strategic planning process is just beginning and will last for about a year, at which point we’ll have a guiding document that can help to shape policy, inform key decisions, and offer a tool to measure progress. Check back here in the future to learn how you can be involved! 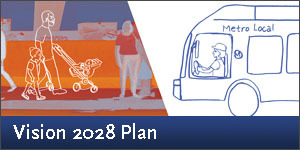 December 2017 -- Metro Receives Unsolicited Proposal To Deliver Advanced Technology And Accelerated Delivery To Vermont Avenue Transit Corridor Through A Public-Private Partnership – Public.